Mini cakes. Made from quinoa. Gluten-free. Chocolate. Coconut. Bourbon vanilla. Chili powder. Orange zest. Espresso. These are a few of my favourite things!!! These cakes are based on my Dark Chocolate Quinoa Cake, which is now the KitchenOperas house cake. I’ve used the recipe to make cupcakes with mocha buttercream icing, big cakes, and now little cakes! Ashley has used the recipe to make Black Forest Birthday Cupcakes, Chocolate Caramel Cupcakes for my bridal shower, and even Gluten-Free Chocolate Quinoa Cupcake Waffles (believe me, those are going to be breakfast soon around here!)!! So of course, I did it my way, played with the flavours, combined everything delicious, and topped the whole shebang with chocolate chips and toasted coconut. 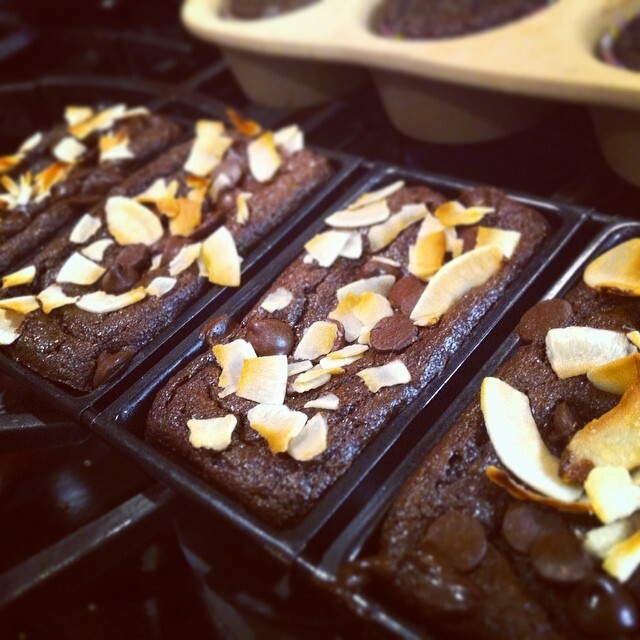 Adapted from my Dark Chocolate Quinoa Cake, makes 24 cupcakes, 2 (8″ or 20cm) cakes, or 12 (5 x 3″) mini loaves. Grease two muffin tins (or two x 20cm/8″ cake pans or your mini loaf pans) with coconut oil, or use cupcake liners. In a blender, add the quinoa, coconut milk, eggs, vanilla, coconut oil, and espresso. Blitz until smooth. In a separate bowl, whisk together the coconut sugar, cocoa powder, cinnamon, orange zest, Aleppo pepper, baking powder, baking soda, and salt. Once well combined, add the quinoa mixture from the blender. Pour the batter into the greased pans (filling cupcake or mini pans to 2/3 full) and sprinkle the chocolate chips and toasted coconut over the top. Bake for 20-45 min. at 350F, until a knife or skewer inserted into the centre of the cakes comes out clean. Let cool and eat with delight! ← The baby cheeses are here!!!!! !